1. Bae Buccaneer S.Mk.2B - XX895 -- G, "Jaws/Lynn/Glenfiddich" Transit from Muharraq Air Base, Bahrain to RAF Lossiemouth 17th march 1991. 2. Bae Buccaneer S.Mk.2B - XW547 - R, "Guinness Girl Pauline The Macallan". Transit from Muharraq Air Base, Bahrain to RAF Lossiemouth 17th march 1991. 3. 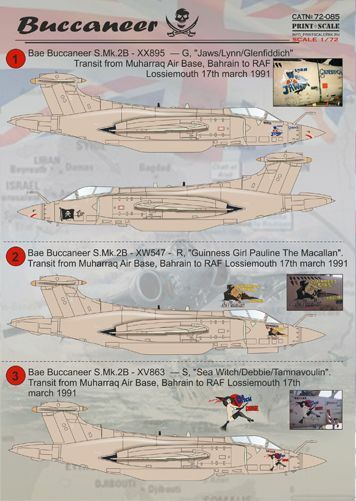 Bae Buccaneer S.Mk.2B - XV863 -- S, "Sea Witch/Debbie/Tamnavoulin". Transit from Muharraq Air Base, Bahrain to RAF Lossiemouth 17th march 1991. 8. Hawker Siddeley Buccaneer S.2B XZ 430/G of No.208 Squadron during 1979. Camouflage matt dark green and dark sea grey. 9. Hawker Siddeley Buccaneer S.2B XV/333/l of No.16 Squadron during 1979. Camouflage matt dark green and dark sea grey. 10. Hawker Siddeley Buccaneer S.Mk.2B XN 976 of No.208 Squadron Lossiemouth,1991. 11. Hawker Siddeley Buccaneer S.2 XT 271/LM-240 of 700B Squadron in 1965. Gloss finish of extra dark sea grey and white.